Whoa, that's awesome! Thanks for posting instructions on partitioning/mkfs-ing disk images, and that cool screenshot. I'd never have thought SoftPC would run! Yeah, it's a really good sign that such an intense program like SoftPC works! .. Although it is SLOW. Like incredibly slow. I havent tried it on aux/2 as I think my version needs system 7.. But wow yeah it runs, which means your 68020 core is pretty darn snazzy! I forget how slow it was on my Quadra, but I recall being able to play BattleTech at an ok clip. I need to start porting over some C/F77 code to see how it responds. I suspect it'll run much faster! I just got hit by some idiot claiming I was spreading viruses. My provider freaked out, and without any chance to defend myself, they deleted EVERYTHING.... So ... Yeah. I'm going to try to re-create the blank disk images. Maybe someone who downloaded them can provide them again??? You might want to talk to your provider (assuming you stick with them) and explain what those files are -- likely whatever scanner the freaker was using detected "zip bomb" style activity (small file expanding to really huge file) and didn't understand the alert his software gave him. I'd also be interested to know what software product was being used and what the detection was -- I could possibly pressure a few people into at least changing the wording of the detection. If it was an actual malicious false positive, that could get fixed really quickly (so you won't be flagged up again next time). I wish I could. I barely got a 'The Data center has null routed because of virus complaints originating from 216.231.130.102. ', followed by a 'In situations such as this, where a server has been compromised, we require the server to be reinstalled with a fresh OS installation. Please let us know how you would like to proceed' message. And then their ticketing system went down. I don't know what to make of that. I had enjoyed their speedy service for a while, but now I wonder if they are simply no more. The backup of my blog was a week out of date, and as luck would have it I don't have the disk template files anymore. At least I wrote down what I did so I guess I can re-create them again. Basically they didn't tell me specifically what is going on. Googling my old ip address + virus seems to tell me that because I kept an old copy of vncviewer.exe lying around (because it works great with Qemu/KVM), and compiled and provided executables for NetHACK for Windows NT MIPS & Windows CE i386, I am now 100% suspect. I don't get it. Others chimed in on here, but the long story short is that various unrepeatable faceless companies can now cry fowl, and get you not only unplugged, but deleted. I don't know what is worse, fly by night "virus/security" companies like Symantec, trend and bkav or the knee jerk ISP's (like fragready) who won't listen to their customers, and delete all their stuff. Blind faith in automation seems to delude us. The false positives have taken over from the missed negatives. These two are the culprits for all your woes... despite the fact that 50 other way more reputable vendors list everything as clean. The only odd one is http://vpsland.superglobalmegacorp.com/ ... wdoom2.zip -- which BitDefender detects. They're usually pretty good, but they base a lot of their decision on what others say and don't do all that much investigation themselves -- so this was probably based on the other false flags. Time to name and shame your ISP and the "AV" vendor, as that's unacceptable policy on both parts. Nobody reputable would pull something from a site based on those results. Let me know if this doesn't resolve itself well. Yeah... I mean it can be annoying fighting RBL's if you get some user with spam, but if someone flags your files and you have people who apparently don't trust you.. wow. What bugs me is that I wasn't even sent an email, just server taken offline, then when I ask their ticketing system is down... or shutting me out. I was hoping by now that they (fragready.com) would tell me why they did this to me, and who provided them the data, but for the last four days their ticketing and contact system is down. They also don't reply to emails so I really wonder if they are even in business at this point. It is a shame I had liked their service before, and had actually recommended it to others. I had to move my wife's email server to another provider, as they've left me in the lurch by not even quickly getting the box up. four days of downtime is death in this business, that is for sure. Oh well, in positive news, I saw that there is a source update to shoebill where it apparently can now read the kernel from disk! Time to update xcode, and build a new version, and create new disk templates. I guess I'll go with mega.co.nz or whatever it is. I downloaded all of your disk images. If you want them "back", please let me know. That would be great, I'm just feeling too lazy the last few days... I know I need to start putting stuff together, but just feeling meh about the whole thing. It was a big enough thing to get my wife's email working again. I just built the latest sources on github, and wanted to say that it worked great for me! It's cool that it can read /unix on the disk all on it's own! The only 'catch' is that I had to remove -flto in the core makefile. Otherwise I get invalid instructions on link.... Is this a pluggin for Clang I should be looking for???? 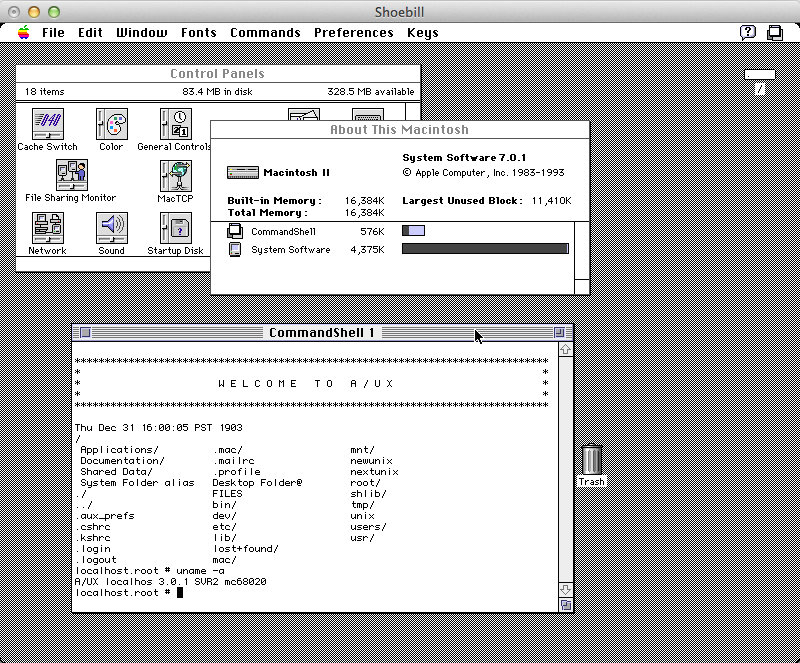 Now using 2.0 image from Macintosh Garden, works great... There's random stuttering through, and the mouse goes really fast. Figured out what was going on... Used a corrupt image, using a working image now working fine. Haven't quite gotten to PRAM, VIA timers, or 16/32 bit video yet... but I'm thinking I'll just release 0.0.2 soon anyways. The major new features are that it sorta kinda supports A/UX 3.0.0 (but not any other 3.x.x version), and that it can automatically read the kernel from the image. Okay! Release 0.0.2 is available. You no longer need to supply your own kernel; Shoebill can read it directly from the root filesystem. For 0.0.3, I'll try to allow restarting without crashing, and see if I can get 3.0.1 to boot. Making progress on booting 3.0.1 in a private dev branch! Ignoring STOP instructions seems to let A/UX 3.0.1 startup make progress... so, guess it's hung up on some interrupt that I haven't implemented. Also making progress on VIA timers & PRAM. pruten can you port Shoebill to windows and linux? You can make the gui with GTK+ or wxWidgets .